The DreamWeaver merges sacred geometry and the science of cymatics* (vibroacoustics) into one of the most powerful transformational devices within the paradigm of Mind Body Medicine. 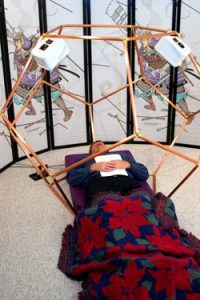 The DreamWeaver is a large copper dodecahedron (12-sided geometric structure) with a sound bed in the center and speakers mounted in the bed and the framework above. The speakers in the sound bed vibrate the physical body allowing us to release tensions and knots that occur in the muscles and nerve structure of the body. Meanwhile, the music swirling through the geometrically defined space above the body interacts with the human energy field, in particular, the chakras and the mental/emotional aspects of the aura, all of which are energetically shaped and contained by the copper rods forming the dodecahedron. 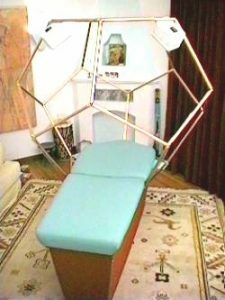 The musical sound vibrations moving through the sound bed beneath the body affects all physical levels while the dodecahedral shape amplifies both auric energy and sound energy to enhance mental/emotional transformation. The person in the DreamWeaver is usually physically inactive but mentally and emotionally interactive according to the issues of focus defined through the intent statement at the beginning of the session. The whole being experience of a DreamWeaving Session rearranges our energetic structure through sound, vibration, shape, and focused intent in a beautifully soothing and heightened experience of music. The DreamWeaver offers a powerful tool for stress and pain management, emotional pain relief, energy balancing, physical and emotional healing, and hence overall wellness. Countless studies have shown stress to be the largest contributor to disease, but thousands of DreamWeaver clients in the US and Europe have reported significant positive effects in stress reduction and the restoration of emotional and mental balance. Further, those dealing with ongoing medical conditions testify to accelerated pain relief, increased healing, and a renewed sense of well-being. DreamWeaver sessions usually last from one to two hours and are available by appointment. Our Certified DreamWeaving Facilitators are continuously exploring and incorporating new applications for the DreamWeaver in pre- and post- allopathic care, prenatal care, the relief of symptoms of ADD, ADHD, PTSD, addictions, cancer, and numerous other health issues. In addition, many clients combine finely crafted intent statements with DreamWeaver sessions to relieve difficult emotional issues much more quickly than possible with conventional methods. DreamWeaver sessions usually last from one to two hours and are available by appointment. and the Effects Of A DreamWeaving Session. A DreamWeaving Session creates a synergy of cymatic effects, combining the energetic properties of sacred geometry expressed in the copper dodechahedron, the energy of the verbal intent statement, and the music that amplifies the intent within the DreamWeaver. “Cymatics” (from the Greek, kyma, meaning “pertaining to waves,”) is the study of wave phenomena, a science pioneered by Swiss medical doctor and natural scientist, Hans Jenny (1904-1972). For 14 years he conducted experiments with sound vibrations on inert powders, pastes, and liquids to animate non-living substances into life-like, flowing forms that mirrored patterns found throughout nature, art, and architecture. His research and meticulous documentation is preserved in motion and still photography that dramatically illustrates the richness of the world of cymatics and shows how the properties of any medium to change under the influence of sound vibrations. Synergy refers to the interaction of two or morer agents to produce a combined effect greater than the sum of their separate effects. Jenny’s ground breaking research, complete with hundreds of b/w and color photographs illustrating the effects of vibration on matter, was reprinted in the one volume edition, Cymatics: A Study of Wave Phenomena and Vibration(available from Amazon.com). There is much information at Ted Talks and elsewhere on the implications of cymatics.